Three stub axles were tested. The OEM part from a HG Holden, an aftermarket part from Stubtech, and an aftermarket part from CRS. The parts are shown in below in Figure 1. The chemical composition of the materials corresponded to (OEM: 1345 Steel); (Stubtech 4340 steel) and (CRS: 1045 steel). 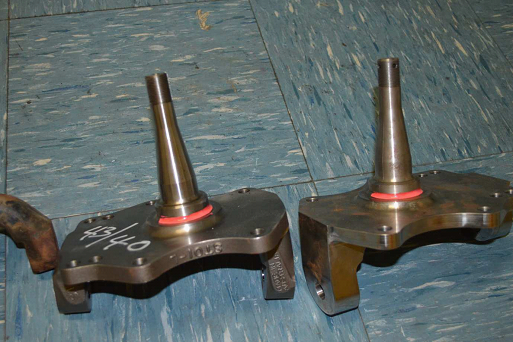 Hardness was checked on all three parts on the spindle, 3-4 times each following normal procedures. The results are shown in Table 1. Note that the OEM part was tested at a different location to the other two axles due to a geometric restriction. In general hardness broadly relates to a range of mechanical properties, including wear resistance. Figure 2. Position of cut on spindle. The spindles were cut as shown by the red line in Figure 2. Each spindle was identified by engraving before sending to a NATA test laboratory (Bureau Veritas, Thebarton, SA) for independent tensile testing. 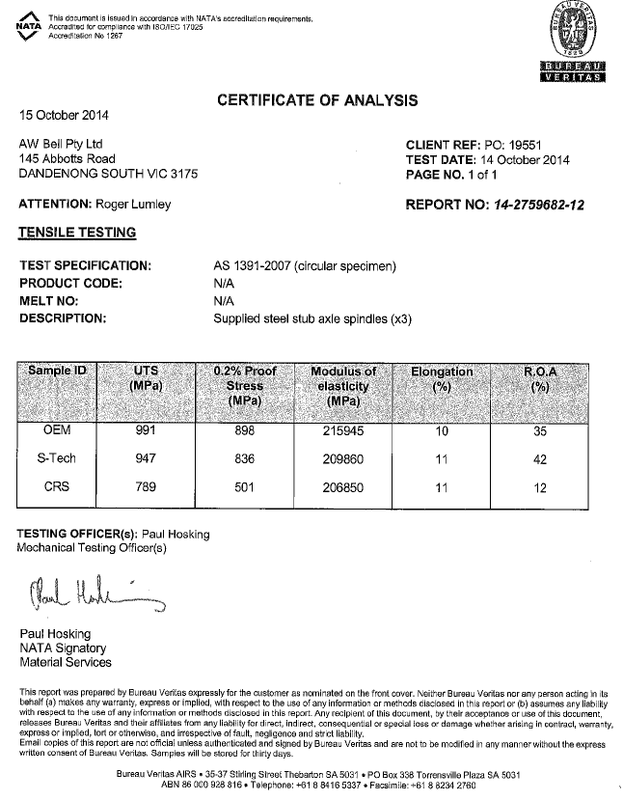 Tensile testing was conducted according to procedures outlined in AS1391-2007. Modulus of elasticity is the stiffness of the material; Elongation is the engineering strain, or tensile ductility; ROA is the reduction of area (another measure of ductility at the area of final fracture).